Vintage English cast aluminium Ladies model Hand Fork. Stamped 'Frys' and 'Made in England'. 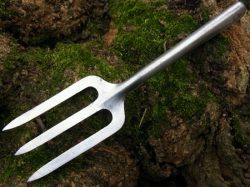 After style of Fork manufactured by 'Bunny'. 8 inches (20cms).